A coalition of Canadian and US environmental groups say American citizens and businesses, including Victoria’s Secret, Aveda and Norm Thompson Outfitters, deserve credit for a major environmental victory announced this week in British Columbia. More than five million acres of forest, an area 100 times the size of Seattle, will be protected for mountain caribou, one of North America's most endangered mammals that travels between Canada and the US. Today, fewer than 2,000 mountain caribou remain. Mountain caribou enjoy legal protection in the US under the Endangered Species Program, but in Canada their numbers have been rapidly diminishing due to habitat threats. The recovery plan commits the BC government to legislating protections from logging and road building over five million acres. This will include new protections amounting to over one million acres, and upgraded protections over hundreds of thousands more. The plan also commits government to developing more environmentally-friendly forest practices in surrounding forest habitat and restricting motorized recreation in caribou habitat. During the three-year campaign, messages were sent to the BC government by celebrities, customers of BC forest products, business leaders and more than 16,000 US and Canadian citizens. Nearly 600 US businesses wrote directly to BC Premier Gordon Campbell, urging greater protection of mountain caribou habitat. 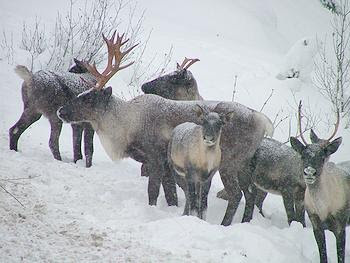 Mountain caribou are an ecotype of the woodland caribou that is found across Canada and parts of Alaska. They live in old-growth forests in steep mountain ranges, where they rely on tree lichens for their winter food. Their numbers have plummeted from about 2,500 animals in 1997 to 1,900 today, largely due to logging, road building and flooding from dams. Today’s announcement commits the BC government to restore their numbers to at least 2,500 animals.